Cold-induced activation of brown adipose tissue (BAT) is mediated by norepinephrine and adenosine that are released during sympathetic nerve activation. Both signaling molecules induce an increase in intracellular levels of 3′,5′-cyclic adenosine monophosphate (cAMP) in murine and human BAT. 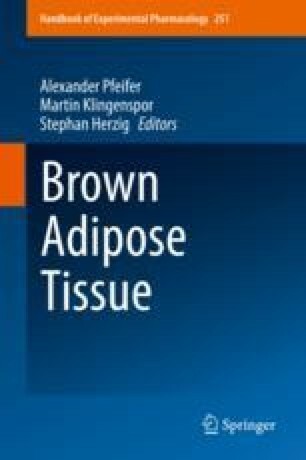 In brown adipocytes, cAMP plays a central role, because it activates lipolysis, glucose uptake, and thermogenesis. Another well-studied intracellular second messenger is 3′,5′-cyclic guanosine monophosphate (cGMP), which closely resembles cAMP. Several studies have shown that intact cGMP signaling is essential for normal adipogenic differentiation and BAT-mediated thermogenesis in mice. This chapter highlights recent observations, demonstrating the physiological significance of cyclic nucleotide signaling in BAT as well as their potential to induce browning of white adipose tissue (WAT) in mice and humans. LR-S and AS contributed equally to this review.